Jack Anthony Ferrante was born March 9, 1916 in Camden. He grew up during the Depression in the hardscrabble neighborhoods of South and West Philadelphia. Jack dropped out of school in the 10th grade to work for A&P, and played football for fun in local parks and sandlots. He stood 6’1” and was quick, strong and sure-handed. After Jack turned 18, he began playing for pay for teams in the Eastern Pennsylvania Football Conference, which sometimes pitted semipro clubs against small college teams. In 1939, he joined the Wilmington Clippers, a team owned by the Philadelphia Eagles. 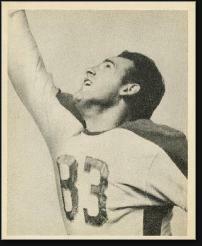 The Clippers functioned as a farm team and, in 1941, Jack was called up to play in three NFL games. In 1942, the Eagles played the Clippers, and Jack caught three TD passes for Wilmington. Jack finally earned a full-time job with the Eagles in 1944. That team had the makings of a champion—including future All-Pros Steve Van Buren, AL Wistert and Bucko Kilroy. The Eagles fulfilled this promise a few years later, when they reached the NFL title game each year from 1947 to 1949, and were crowned league champions in 1948 and 1949. Jack teamed with quarterback Tommy Thompson and his backup Bill Mackrides to catch 80 passes during those three seasons. His nickname during those years was Blackjack. 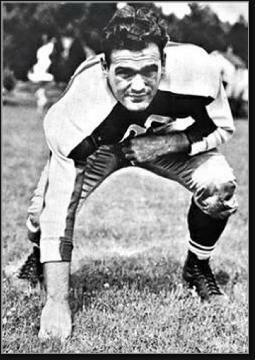 He earned second-team All-Pro honors in 1945 and again in 1949. In 1950, Jack had his best season, catching 35 balls at the age of 35. That was also his final NFL season. He retired with 169 receptions and 31 touchdowns in 81 games. Jack was one of the NFL’s best deep threats. He ranked in the Top 10 in yards per catch five times and was among the NFL touchdown leaders twice. He was also a fine defensive end. After his playing days, Jack went to work in sales for Ortlieb Brewing. He also coached high school football in the Philadelphia area. In 1959, his Monsignor Bonner Friars won the city championship by a score of 54–0. The school had only begun in 1953. The Friars repeated as champs in 1961. In the mid-1960s, Jack coached the Wilmington Comets of the North American Football League. Jack retired from his sales job in 1977. He was proud that Vince Papale—another receiver who went from the sandlots to the pros—wore his #83 jersey. In his later years, Jack moved between Springfield, Delaware and a summer home in Ocean City. He eventually moved to a nursing home in Yardley, PA, where he passed away in 2006 at the age of 90. When the Pro Football Hall of Fame named its Team of the 1940s, Jack was among the seven players on that team who played end.